Larry is an artist on and off the water, and lives a life many of us dream about. With fly rod in hand he hunts the shallows of the hyper saline Lower Laguna Madre and crashes through the surf chasing his silver kings. Victory photos as reference and another exciting experience on the water fresh in his mind he heads back to his studio and paints some of the most incredible images that have personified our sport. Somewhere in all of that he takes time to run a fly shop that allows the rest of us an opportunity to have some small degree of his success. It doesn’t leave room for much else, so when he afforded me an afternoon to speak with him at his studio/fly shop I jumped all over it like a tarpon on a black on white Shop Mullet – More on that later. Larry is a Harlingen native and his Dad started him fishing with shrimp under a cork. While effective, both at catching fish and getting new fishermen addicted to the sport, Larry was moved to throwing lures as soon as he could escape from under his Father’s eyes. Top water was the weapon of choice and we all know the anticipation, adrenaline and loss of breath it can inflict on an angler. Larry felt like there was something more, another level out there that needed to be identified before it could be attained. And one day a pal showed up with a fistful of fly rods, a big smile and absolutely zero idea about how to cast a fly. They spent hours whip cracking behind their heads and flinching at lines slicing by their ears until a VHS tape, yes I said “tape”, surfaced that featured some guy named Lefty Kreh and beginner level fly casting instructions. The tape spread through the eager young community like wildfire. A dozen novice fly fishermen would pile into a buddy’s house and huddle around the TV and watch the tape together. Over and over, memorizing the moves and running outside to try to replicate them. And that’s how they learned. That and thirty years of on the water experience. Somewhere during those thirty years they learned the most profound concept in fishing and when they did, it changed everything. That concept was: fish when the fish are feeding. Simple and effective, just like the perfect fly. It seems obvious to most, but most don’t really get that. Those that do usually have big smiles and big fish in their catch photos. I smile in my photos because I’m thrilled to have caught anything and so asked a question commensurate with my grasp of the aforementioned concept: “What days do you go fishing?” Larry said “I don’t take a Wednesday off because the fish may not be biting Wednesday. I look at the conditions and when they are right, I call someone in to cover the shop and I go fishing.” Duh, refer to “Concept 1”. That statement illustrates his comprehension of the fishing conundrum and how he has built his life in a way that allows him to live the way he wants to. And the way most of us want to. When he goes he can go any way he wants. He can take his 17 foot Boston Whaler past the jetties and chase those silver kings or get skinny with the tunnel hull of his locally manufactured Shallow Sport. Most of the hyper saline bay is a foot deep or less and the SS can get him where he needs to get. Sometimes Larry needs to get even skinnier so he’ll ferry out his kayaks to within striking range and launch a plastic boat assault on the crystalline shallows. With his mini fleet, arsenal of rods and mastery of the local water the fish have nowhere to hide. Why would the fish want to hide when, if they are worthy, they can be immortalized in Larry’s incredible paintings? These paintings have won him national acclaim, been featured throughout the industry’s top media outlets and would be a gorgeous centerpiece to any fly fisherman’s lair. Some of these paintings hang on his shop’s walls and lend a splash of artistic flavor to the joint that elevates it above “just another fly shop”. Which is fitting because the Salty Fly Shop is not just another fly shop. Fifteen years ago Larry carved the Salty Fly Shop out of a rent-a-car facility at the South end of Port Isabel’s main drag. 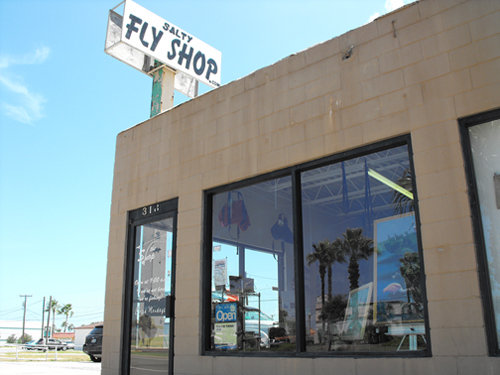 It is THE full service fly shop on Port Isabel providing rod, reels, clothing, etc. but the real value is the immediacy of having equipment on hand in a brick and mortar store. That jack crevalle cracks your rod at the jetties on Friday there aren’t a lot of dot-coms that are going to get you that replacement Sage for your Saturday morning outing. Larry has your back, your Sage, and the current up to date knowledge of what is going on on the water. When traveling far distances to water you aren’t plugged into, local knowledge is critical to getting you on the fish quickly. That’s what Larry provides. This trickles down to the flies that Larry sells. Why des he carry these flies? “These are the flies I’m out there fishing with right now,” he says. He ties them all himself, are you surprised? Didn’t think so. “I tie what I’m using out there … What’s catching right now. I don’t have drawers full of off season flies or flies intended for far away places.” It makes since and it makes buyers confident in their purchases and their fishing. He showed me the Haines Shrimp that Umpqua licenses from him as well as the Shop Mullet and a popping shrimp with a little orange to it. “Our fish really like orange out there,” he said. I bought some. Some customers will call ahead and request a batch of their favorite or hottest flies so they can pick them up on their way to the island. Most of these are repeat customers that make up 70% of Larry’s business and whom he appreciates greatly. In this digital age it may be easier and even cheaper to get the gear you need from a .Com or big box chain store but Larry’s customers appreciate him being here for them and they support him by buying local. Local to the fishing anyhow. Larry even carries some spare gear, still in the box, when he’s fishing in public places just in case someone gets spooled by a king mack or something equally dastardly. About the only thing Larry won’t do for you is guide. He’s concerned it would cut into his fishing time. A man must have priorities after all. 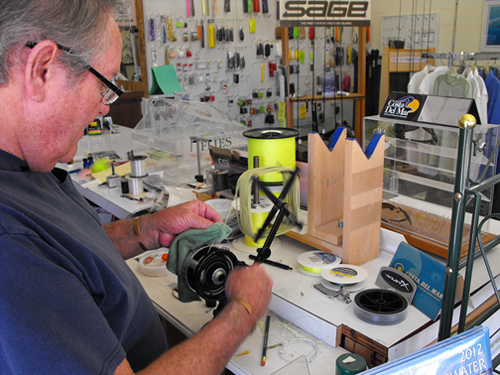 His shop does offer fly casting lessons however and customers that purchase a rod, reel or combo are treated to a free lesson. Everyone is treated to a great selection of gear, beautiful paintings and a friendly shop that can point you in the right direction. Most everyone knows the water here is clear and skinny, excellent for sight casting redfish or targeting trout. It’s the presence of snook and tarpon in this subtropical clime that really piques peoples’ interest though. The reality is this fishery has great depth in both numbers and variety and can accommodate most anglers’ tastes. There is plenty of off season access to the beach for easy surf fishing. Come spring break weekend or other high traffic days and you better go elsewhere. There is prime surf fishing along the 27 mile stretch between Beach Access 6 and the Port Mansfield Jetties. 4×4 and a beach permit will be required for that run. The surf holds three sand bars creating two very fishy guts and the gulf side of the third bar. All should be fished thoroughly unless bait balls, fleeing bait or working birds are spotted. In that case hustle over there and get in on the action because it may not last long. Seagulls are the least of your indicator birds with Pelicans and Terns being your go-to guides. No offense to any fly fishing guides out there. When fishing the bait balls, Larry says it’s still blind casting, but blind casting to fish in a barrel. They are there and they are worked up. All the exotics run through here so a full tackle box and cache of clear water tippet and some wire will be needed. Larry has a very confident air about the surf and the jetties in regards to tarpon and other big fish. Listen to him and you would believe any fly angler has a good crack at the big boys. I listen, I want to believe. Each jetty has its own personality and potential. Which jetty will fish better all depends on which way the current is swinging in the channel. If the current is flowing close to the jetty you are on you are in for a good day. Otherwise you are in for a long drive if jetty fishing is the mission for the day. While The North Jetty and beach is accessible via Isla Blanca Park (fee required, check Cameron County for current rates) the South Jetty must be reached by Boca Chica State Park which is a primitive and undeveloped beach area accessible from Texas Road 4 (check your directions/GPS because many are out of date/inaccurate), but will require driving on the beach (usually 4×4) to reach the jetty. This means less two legged predators and more solitude. The North Jetty generally offers better fishing because the drop off to deeper water occurs closer to shore allowing predator fish to encroach into the shallow water where jetty and surf anglers can reach them. The Boca Chica beach has a more gradual slope that extends a good ways out. Port Mansfield Jetties are another good option, but are often crowded. In addition to the current flow you are looking for clear water that approaches the beach, periods of strong tide movement, preferably from the full or new moon and enough wind to affect the water’s surface just short of hampering your vision and casting. You are also looking for anchovies running the shoreline. “We have Dusky anchovies here. They have more of a tan brown back than the greenies.” When they are in so are the big boys. In the bays it’s shrimp in the fall and baby fish and minnow varieties in the summer. Bay fishing is a cover lots of water game unless you are really dialed in like Larry. Fish areas/structure inundated with water at high tide and holes/deep water at low tide with lots of sighting opportunities during both. The fishing was a little tough after the surge from Isaac and the full moon, but should be hot again as you read this. Please finish this article before you pack up and head to the coast, though. Tarpon. Tarpon are in South Padre. They are large and they are plentiful. Tarpon are a whole other story and deserve an article all to themselves, which is exactly what they are going to get. They are Larry’s passion and he has a lot to say in our forthcoming follow up interview. 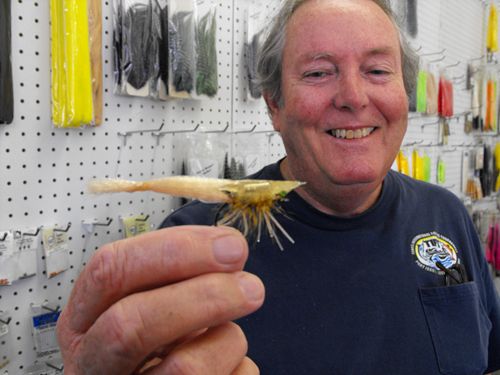 Larry is a proud and active member of the Lower Laguna Madre Fly Fishers Association. They have approximately 100 active members and drool worthy photos on their website. While they are not aligned with the FFF they are very active in their community and provide outdoor and fishing days for children as well as casting and fly fishing lessons for the kiddoes. From the outside their site may not appear to be very active, but apparently that is because all the member are out fishing. With a fishery that provides nearly year round activity it is amazing anything gets done on this island paradise. I encourage you to contact the LLMFFA and get plugged into the action, meet some fellow fly fishers and get hooked up. And I hope you do. South Padre draws people for a variety of reasons, but the primary reason for this group of readers is the fishing. And a stop at the Salty Fly Shop and a visit with Larry Haines will be the primary reason for a successful trip to the Lower Laguna Madre. So come on down, because I hear you are supposed to fish when the fish are feeding. Until next time, Get Bent! Publisher’s Note – Thanks to TFC Reader Immanuel Salas for this report Part 1, and Part 2 to follow.